The Sigvaris Cotton Underliners are cotton compression socks that reduce pain by providing a light pressure on the skin. The 10-15 mmHg pressure not only protects sensitive skin, but the gentle pressure pushes against the veins to help increase blood flow, thus reducing the chance for blood clots. The Sigvaris 10-15 mmHg Cotton Underliners are available in a neutral beige color, blending in with many skin tones. The soft cotton material makes them comfortable for all-day wear and has a long and short option to ensure the best fit no matter the height of the user. 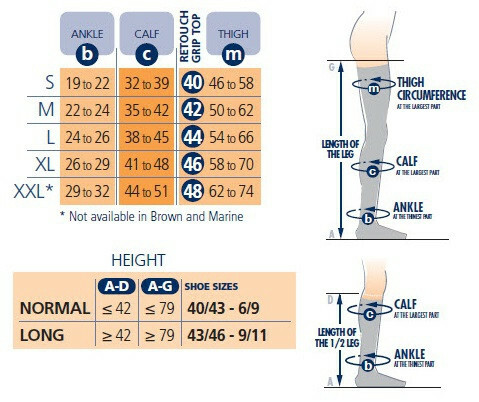 For accurate sizing, users will need to measure around the calf as well as the ankle. From there, please refer to the size chart above to determine if small, medium or large size is best. To determine the best length, measurements should be taken from the floor to the back of the knee. If the height is less than 42 inches, users should select the shorter option, while greater than 42 inches will need the long length. Formerly known as Sigvaris Ulcerx Cotton Underliners, they are used most commonly for every day use. There are also options available for outdoor socks, made of a thicker wool material for warmth, as well as business compression socks with a combination of nylon and spandex for a more professional look. Coming in a variety of styles, colors and compression, Sigvaris is sure to have a compression sock for any need and every person.